When I start my daily run, I run on joy. When there's nothing left of joy I run on determination. When determination is all gone I run on satisfaction for having gotten that far. Unfortunately that lasts only a few minutes, so I proceed to run on willpower and stubbornness. By then I'm sweating and my head is turning red from my efforts. Then when I'm almost done I run on adrenaline and the annoying things that happened that day. That's the part of my run I go fastest. And even though I've run on all kind of emotions, at the end of my run I'm all tanked up. I can totally relate to this! 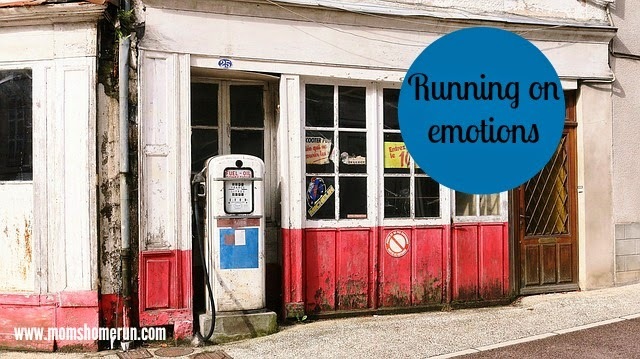 I don't run because my knees just can't take it, but I cycle and I go through all these emotions. Thanks for joining the #FridayFunday linky party! Well now, this is food for thought. I love the inspiration. Thanks for linking on Friday Feature this week! !